Last Friday my beloved and I celebrated our 2 year anniversary. Since we are both artists, we enjoy including handmade gifts. 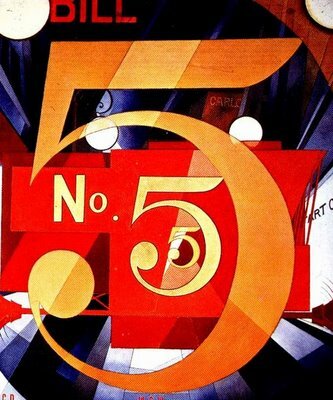 I was inspired by a postage stamp of this painting by Charles Demuth to create an assemblage with the theme of 2. 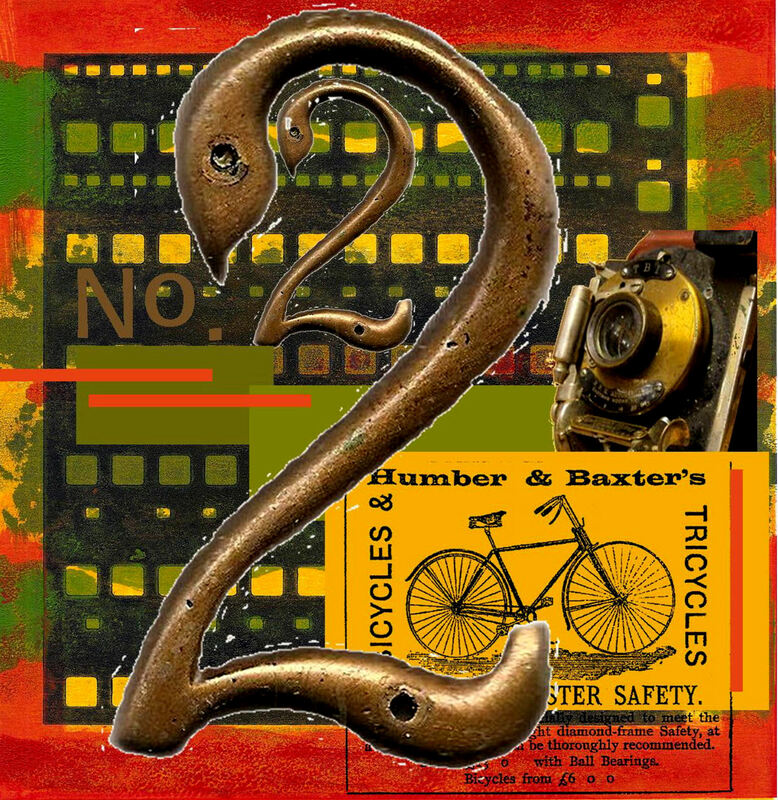 Starting out in Publisher, I created a collage of the elements I had in mind, the most significant being a bronze number 2 that I picked up on our recent trip to Vancouver BC. I scanned the number and then placed it on a copy of a monoprint that I made a few years ago. 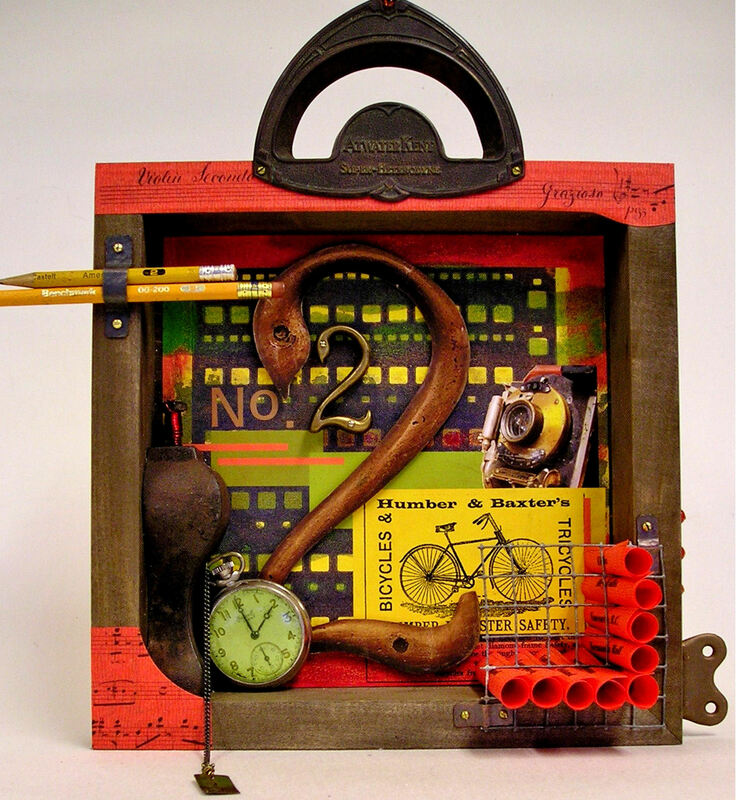 Then I added some color blocks using the monoprint palette, added a vintage bicycle ad and an old camera photo. I wanted a better patina on the brass corner pieces so I spent hours removing the coating with steel wool and then attempting to add back some aging. My efforts were unsuccessful in spite of numerous processes so I abandoned the brass pieces. Along the way, I recognized the familiar waves of creativity. There is that initial spark of an idea followed by the first rough mind sketches. Physical manifestation follows with numerous evaluations: Is the idea working? And then, often, the trough of failure. The no…it’s not working part. I used to be very discouraged by this rising and falling. Now, I find some way to keep moving. 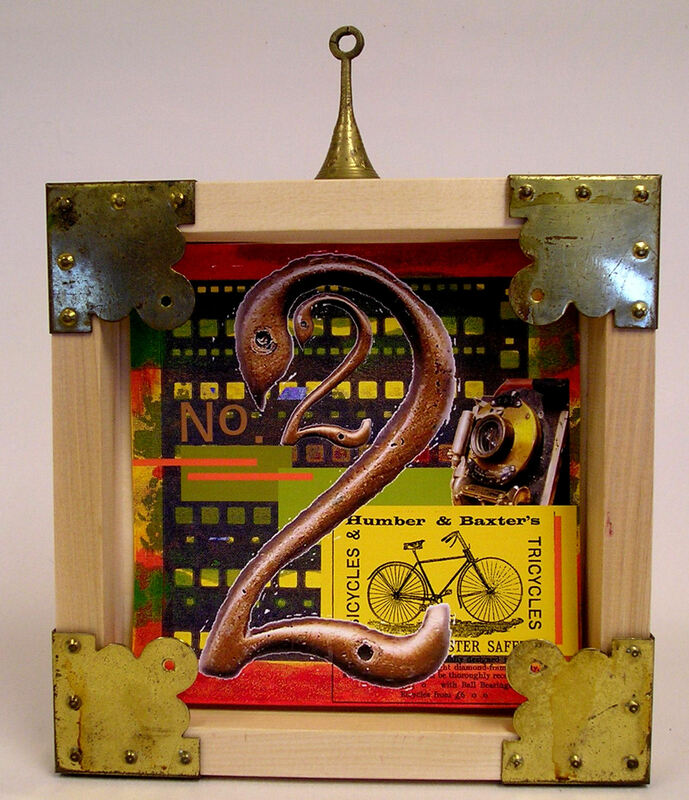 In this case, I also didn’t like the white border around the large 2 so I cut it out and glued it to some card stock. That didn’t really look good either, so I tossed it in the garbage. Then I did some easy work: I stained the frame dark brown, I printed out a copy of the print minus the numbers and glued it in place, always aware that I had a deadline which forced me to make decisions and stay with the process. 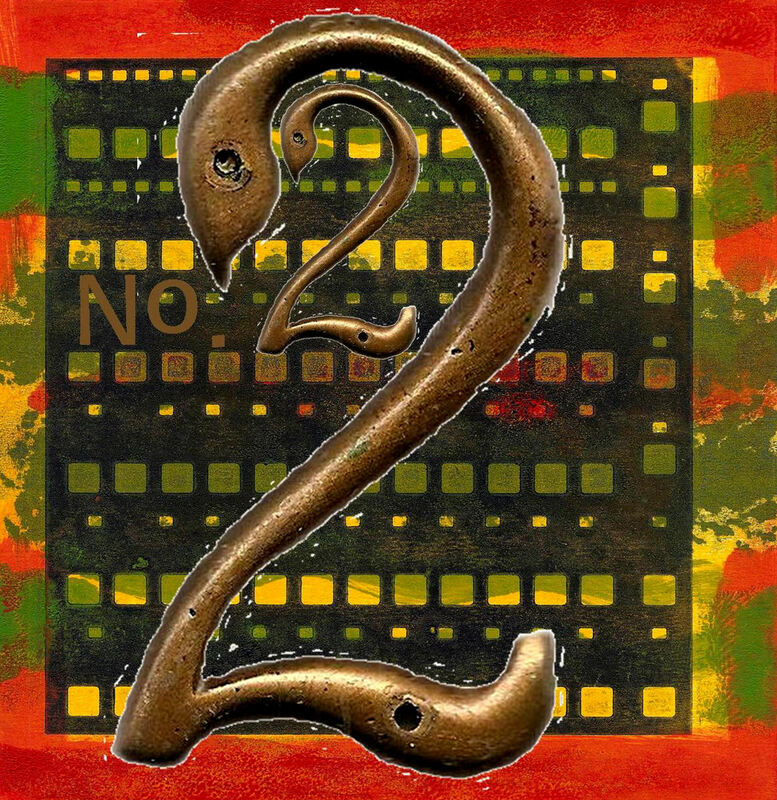 Once I had completed the background, I nailed the bronze 2 in place with spacers to give some height and then wandered the studio some more. When I found the label from a vintage speaker, I got excited again and the next rising wave began. 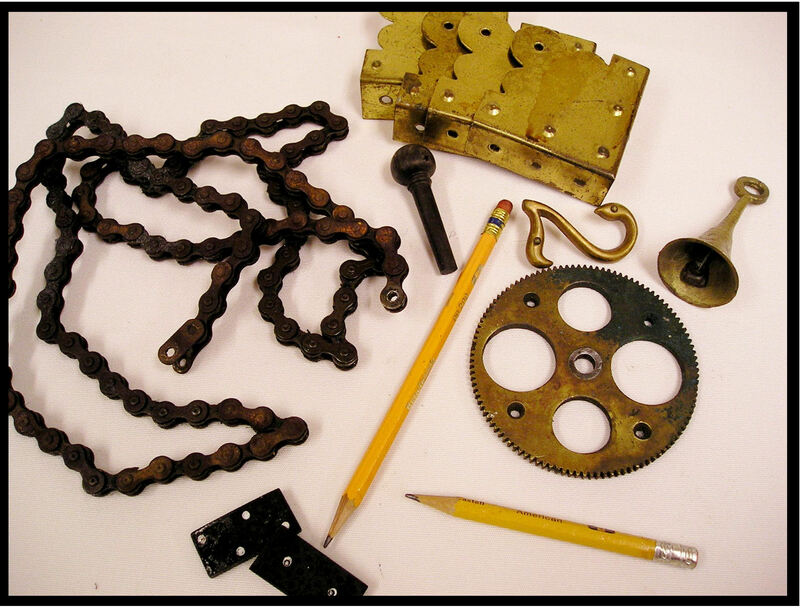 I found an iron piece and wire mesh…an old watch with a strange green face…a marine key for water tanks. I needed some color behind the label, so I printed out some hand written music on red paper and added it to the frame. 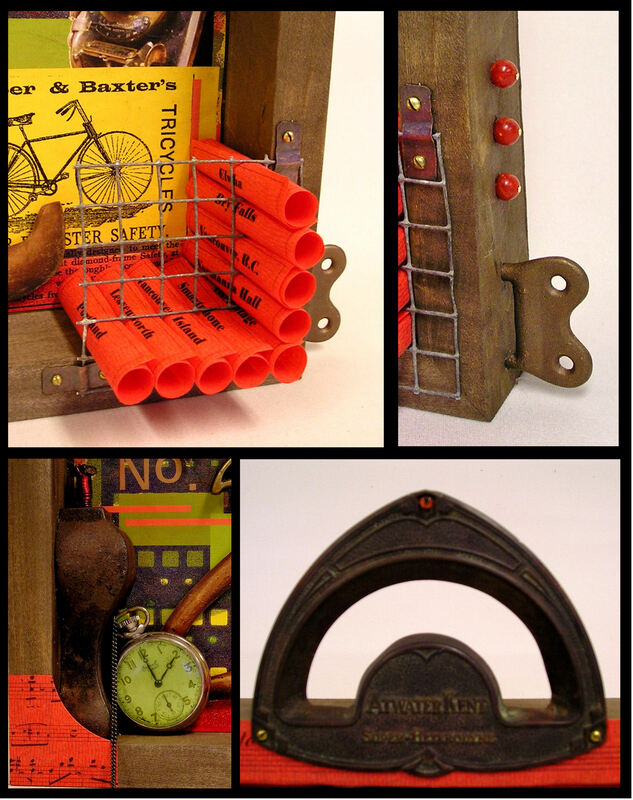 When I drilled the holes for the key, I made a mistake, so I added beads to thoses holes and tried again. Into the mesh squares I put scrolls with titles of places we visited over the last year… also in red. I cut small pieces of copper, textured them with the hammer and aged them for brackets to hold the wire mesh. Then, with a sudden panic, I saw that everything was small. There was no variety. So I grabbed the big number 2 out of the garbage and added some walnut oil to dull the finish, then stuck it in place with foam spacers. Finally, I placed the assemblage on a shelf and stood back to review it. One more something was necessary for balance…something red in the lower left corner…thread of inspiration complete. Wow, what a heartfelt process. Your beloved must be thrilled.